The history of Syros is not known with any certainty. One of the most important settlements of the late phase of the Early Cycladic civilization, about 2400/2300-2100 BC, was excavated by Chr. Tsountas at Chalandriani. The settlement and cemetery of Chalandriani have yielded some notable examples of Cycladic art, such as the frying-pan vessel with incised spirals, the depas amphikypellon, a drinking cup typical of the Troy culture, and the terracotta beak-spouted deep bowl with red glaze. No Archaic issues are attested on Syros. The silver and bronze coins of the island are influenced by the cult of the Kabeiroi here, on which no light is shed by other sources. 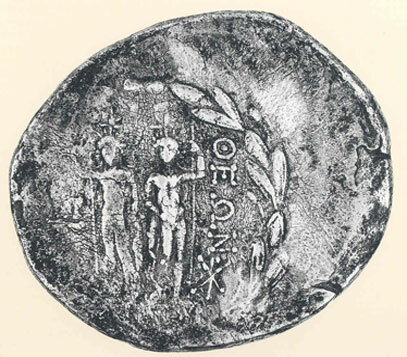 The coins of Syros, like those of Tinos, had only a limited circulation and were of a purely local character. The very rare flat silver tetradrachm on the Attic standard has a depiction of the head of Demeter with a wreath of wheat-ears on the obverse. On the reverse, the two naked Kabeiroi in a frontal pose, leaning on spears. The entire scene is enclosed within a wreath of fir branches.